Why Should I Care About the Power Transition in Beijing? 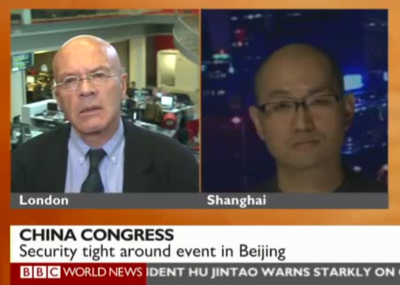 The 18th CCP Congress is going on right now in Beijing, I was lucky enough to be invited to BBC TV and BBC radio to comment on this once-in-a-decade power transition. Before that, I was asking many ordinary people around me about what this moment means to them. Some cannot care less, as they feel they have zero influence on the outcome. Some are watching it as a “Gong Dou Drama/宫斗剧” (Fights-in-the-Palace Drama) and found pleasure in all the conspiracy theories and the tabloids about power elites’ in-fights . Some are busy interpreting and deciphering the formulaic and predictable official announcements, and looking for so-called signals of future policy directions. Some are making their wish-lists of what reform they hope to see under the new leadership. I happen to think that it is futile to try to peek into this black-box of CCP meeting, but it is an interesting moment that triggered a lot of important public discussions about what China did right and what it did wrong in the past decade. In BBC TV’s program, I had a mini debate with Martin Jacques, author of When China Rules the World, who was known for championing the so-called “China Model”. Our debate was so short that I left out some key points, so allow me to make up here. Right before this Party Congress, Mr. Jacques wrote an article saying that the Chinese leaders are more legitimate than the US president coming out of an election. Well, the Chinese government certainly did not show much confidence in its own legitimacy, otherwise we should not having so much problem accessing the real Internet, buying kitchen knives, or letting our pigeons fly. Jacques argues that unity is the core value of Chinese civilization. I find it offending that he feels comfortable to assume the huge population in China composed of diverse communities share one value. And he certainly ignored the fact that the value systems in China changed many times throughout the history. But is unity currently a sufficient source of legitimacy for the Chinese government? What about the high percentage of rich Chinese trying to emigrate out of China? What about the peasants who are protesting against some local governments’ forceful land grab? What about the middle class who held protests against environmentally dangerous industrial projects run by state owned enterprises? It seems people care not only about whether the government holds the nation together with strong hands, but also about whether they can feel safe and free under the government. Mr. Jacques likes to emphasize China’s economic growth in the past 3 decades as a proof of the superiority of the “China model”. But even President Hu in his speech on Nov.8th acknowledged that China’s current economic growth is “unbalanced, uncoordinated and unsustainable”. Also what about the fact that China is still a poor country in terms of income per capita? What about all the costs of nominal GDP growth, from environmental crisis to corruption to unjust wealth distribution? I am not saying that all that growth is illusionary, but we cannot forget that it was the shift away from authoritarianism that initiated the economic growth thirty years ago. Mr. Jacques suggested that the lack of democracy contributed to the efficiency of China’s economy. Following that logic the centralized economy under Chairman Mao should have been the most efficient. Even today, the local governments and state owned enterprises are misallocating resources to the extent that wasteful and low-quality infrastructure projects are becoming a liability rather than an asset, real estate bubbles in places like Erdos and Wenzhou are busting, and so-called innovative projects heavily sponsored by tax payer’s money, such as solar or cloud computing, turned out to be technological disasters and hotbeds for corruption. Mr. Jacques’ view has won him popularity among the power elites in China. But even the leaders of CCP have stated many times that “reform” is urgently needed to make the people more satisfied, evidently they are aware that economic growth and nationalism no longer can bring them the desired “stability”. Meanwhile, the increasing exposure to the outside world has changed the Chinese public’s expectation of their government fundamentally, although few of them are calling for a whole-sale adoption of western-style democracy, many are calling for more openness and transparency of the government and more rule of law. If China manages to overcome the current challenges, which is certainly my hope, it will not be the victory of the “China Model” that Mr. Jacques extolled, rather it will be a result of the Chinese public’s success in “reforming” the government. ◆ Jin Ge aka Jingle is a writer, documentary filmmaker, and NGO organizer based in Shanghai. Jin does sociological research and produces multi-media content on the subjects of Internet subcultures and grass-root organizations in China. He is currently a senior design researcher at IDEO.